Terri Osburn does not create simple, non-dimensional characters. They are multi-layered, complicated, and flawed, making them infinitely more interesting. Take Haleigh, the heroine of My One and Only. Here is a woman who has regrets, who carries guilt and shame. A respected doctor, she has the outward appearance of a successful woman who has her life in order but, inside? Inside, she's one hot mess - a recovering alcoholic battling issues of self-esteem, and enough parental baggage to sink a boat. Returning home to Ardent Springs six months ago after the failure of her third engagement, she's working as an OBGYN at the local hospital, renting a room from her best friend, and trying to establish a healthy relationship with her impossible-to-please mother, an almost impossible task. There's no time in her life for a man, especially not her best friend's twin brother and all-around good guy, Cooper Ridgeway who most certainly deserves someone much better than Haleigh. Cooper Ridgeway feels like he's spent his whole life loving Haleigh Rae Mitchner but he's never felt worthy of her. His mean, drunk of a father did a number on Cooper's self-esteem that far outlasted the man's life. Even though Coop runs a successful business, he can't imagine what an educated, confident, doctor would ever see in a small-town mechanic so he keeps his distance. When a pregnant teen searching for her biological father brings Cooper and Haleigh together, Haleigh begins to view him as more than her friend's brother and when things begin to sizzle, Coop sees an opportunity to finally go after the woman he's always wanted. But when complications arise and truths begin to surface, will it bring them together or tear them apart? There were times in this book when I was angry with Haleigh's behavior, when I wanted her to stand up for herself and for Cooper. But when you've spent most of your life being told you're not good enough by the person who should love you the most, it plays with your mind, your heart, your very soul. It creates patterns of behavior and belief that are not overcome quickly or easily, at least not in real life. Kudos to Osburn for keeping it real with this character and not taking the easy path. It may make it harder for some readers to like Haleigh but, for me, it makes this a more interesting, realistic, and, ultimately, satisfying story. Then there's Cooper. Oh, my. Terri Osburn writes some terrific book boyfriends and Cooper, for my taste, is the best of the bunch. Much of the time I wasn't sure if I wanted to hug him, jump him, or give him a stern talking to but from the first page to the last, I never wavered in my adoration of this character as I cheered him on in his quest for a happy ending with his one and only. I do hope we'll be seeing more of him in future books. A community of secondary characters rounds out the cast, including the main couples from the first two books, whose relationships are progressing, and new characters who I'm hoping will figure prominently as the series moves forward. 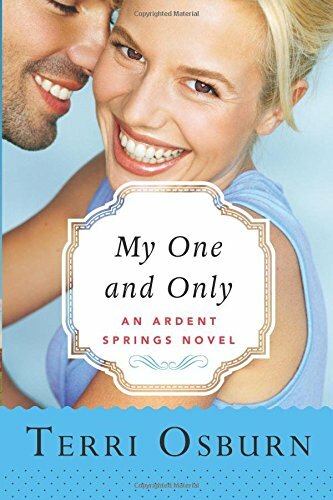 If you enjoy small-town, contemporary romance with a rich depth of emotion, realistically flawed characters, humor, sizzle and a whole lot of heart, look no further than Terri Osburn's Ardent Springs series. My One and Only can easily be read as a stand-alone but for a more complete understanding of the characters, both primary and secondary, I recommend reading the books in order: His First and Last, Our Now and Forever, and My One and Only. BEAUTIFUL!!! Terri does write complex heroines and dreamy heroes!!! Huzzah on this fabulous third book in the series!! The first 2 books in this series were really good, and I am looking forward to reading this one too. I enjoyed the first two also, Cheryl but this one is my favorite of this series so far. I've read the first 2 books in this series and looking forward to this one. Thanks for reminding me this is out there.